Moving can be an overwhelming process—one that can easily leave you wondering if giving up all your earthly possessions and moving to a tiny cabin in the woods might be the best solution. Turns out, you don't have to be quite so rash. Simply Self Storage recently put together a list of 50 helpful moving hacks (complete with instructional GIFs) to help save time, money, the environment, and your last shred of sanity, including tips for packing up five major areas: the bedroom, living room, bathroom, kitchen, and home office. Before you start packing, heed the golden rule: You don't want to waste any time or energy packing up things you don't need to keep. 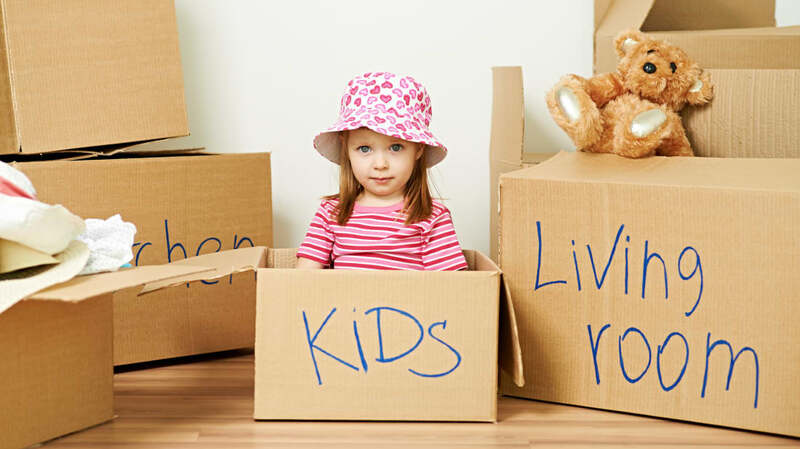 So before you start throwing things in boxes, take stock of your stuff, and toss or donate the items you no longer need or want. Do a full KonMari if you need to. Once you've purged your closets and every room in the house, it's time to start wrapping and boxing. To use every inch of space that you can, try putting big items in boxes first, then tuck smaller items in the area around them. If a box is getting heavy, but still has room left, put something light—like a towel—on top. When tackling the kitchen, skip the bubble wrap and use towels or clothing as padding between dishes and other breakable crockery instead. When packing up your closet, turn garbage bags into garment bags by sliding them over clothing on hangers, then tie a knot at the bottom. Bag a handful of garments at a time so that you don't go broke buying trash bags. As for your shoes: maximize space by stuffing them with small items. Speaking of small items: pack jewelry into empty egg cartons, so it doesn't get tangled. Just tape it shut after you're done and try to keep it upright during the move. When boxing up the bathroom, use a binder clip as a blade guard for your razor to prevent accidents while unpacking. Protect your precious foundation, eyeshadow, blush, and other makeup compacts from cracking in transit by stuffing them with cotton balls. If you're trying to sell your house or get the security deposit back on your apartment, you're going to want to take the nails out of the walls. Before you do, wrap a rubber band around your hammer like so to avoid leaving scuff marks. Use toilet paper rolls as an eco-friendly storage solution for cords and chargers—and don't forget to label them (you'll thank yourself later). If your impending move is still causing anxiety, even with all these tricks, check out this timeline infographic to learn what you should start doing well ahead of Moving Day. For the full list of moving hacks—and even more GIFs—head over to Simply Self Storage.